So you know that Althea came over & ran a great seminar for us in Dublin on Saturday 24th. Encouraged by that & her motivation at the end of the event we've now got our support group going; our first meeting being Wednesday 5th May at 20.00. If you're going to be in Dublin & are a womb twin survivor (or think you are) you're most welcome to come along. This is where you can get the details. So, while it's early days for us we're happy with the progress we're making & will be doing an art-based session in the near future thanks to Paula. If you'd like any encouragement in setting up Womb Twin or a support group in your own country, do get in touch with me & I'll be happy to help. For setting up Womb Twin in your country also look at the guidelines at the bottom of the page that this link takes you to. (The first thing I'd say is "Do it!") Send an email to me. Towards an international Womb Twin membership organisation? In Dublin last weekend (great weekend, check their blog) it became clear to me that in a few years' time. rather than having discreet groups around the world, we ought to have a single international organisation, WombTwin Worldwide. Anyone out there want to help make this happen? That kind of thing is a bit beyond me, but some people are really good at building worldwide organisations. Contact me for more. It was great to be on RTE radio in Ireland yesterday. The scepticism took the form of, "Isn't that feeling you mention just a normal feeling and everyone has it?" Which was very mild in comparison to being "Weirdo of the week" or "A fraudulent quack" or "Dangerous". At last, an intelligent debate, with no abuse being thrown. A delightful experience, in fact! The workshop in Dublin for 24th April (get details here) promises to be a very interesting experience. As a result of six months of work so far on my new book, Womb Twin Survivors, there is better information and MUCH better illustrations on my presentation than ever before. I will be there, so answer questions and lead workshops. If you can come, do come! It will be a while before I am Ireland again. Register here now, pay later! It's Andrew from Womb Twin Ireland, here! We've just had an exciting event today - our first, shared with Althea, radio interview. This was on of the national radio stations. It was a recorded interview & tomorrow we''ll find out if it's going to be broadcast. If it is you'll be able to hear it here so check back regularly. Personally, up until a year ago I didn't know about Womb Twin Survivors; turned out I had two womb twins, Hazel & Anthony. She was fraternal, he identical. The year's been an intense one of sadness, anger, rage, remorse & now, with much gratitude to Althea, the light has arrived & I'm living life, taking action & helping other people. I built a website for this work - wombtwin.com. I had created a new word - " wombtwin" - so I was able to see the idea spreading across the internet. I then gathered some reports, published work and stories together to create an anthology of chapters written by people from all over the world and called "Untwinned." Soon I had a small collection of useful books for womb twin survivors and people who wanted to learn more about them. We now have a membership organisation, called Wombtwin.com Ltd. and anyone who wants to can become a member. The research continues, and I am still writing - at the moment it's a comprehensive review of my eight years of research called Womb Twin Survivors, but there will be others, in time....follow my progress on my Wombtwin Survivors blog. I am delighted to be a contributor to this blog and I look forward to reading posts from womb twin survivors all around the world - how exciting! 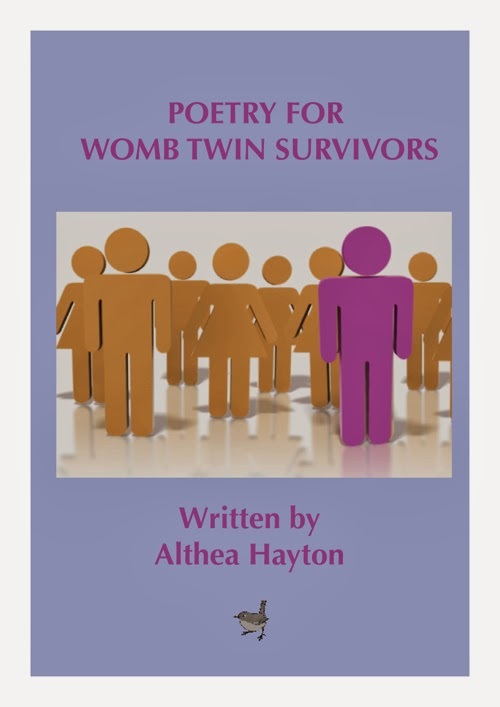 This is a new venture, to reach out to womb twin survivors around the world in as many languages as we can, with dozens of different authors. If you would like to join us and write a post for us about once a month, about any aspect of being a womb twin survivor, then please email us today. For today, as we wait for the posts to come in, please click the links to the various blogs and see what is going on around the world.